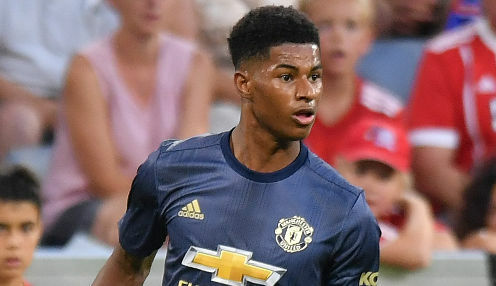 Gareth Southgate claims Marcus Rashford is a "big part" of England's future after his winning strike against Switzerland. The Three Lions' chief watched the Manchester United striker add to his Nations League effort in Saturday's 2-1 defeat against Spain, by firing in a close-range volley on 54 minutes to secure a 1-0 friendly success against the Swiss at Leicester's King Power Stadium. His work for the team was fantastic and he'll feel very confident going into the games coming up. He misses the next few, which is why he started again. The 20-year-old has five goals in 27 appearances for England and, while he faces a big fight for regular action, Southgate is in no doubt that the youngster will be a pivotal part of his squad looking to the future. "He's a big part of our future. We think he's a fantastic talent with a great mentality. We've really talked to him a lot about being in the penalty box more, higher up the pitch - and both of his goals have come in those areas. "We know he can score spectacular goals from long range, but you'll be limited in numbers if that's where your goals are coming from. "His work for the team was fantastic and he'll feel very confident going into the games coming up. He misses the next few, which is why he started again. A real breakthrough for him." Meanwhile, Southgate was pleased with the second half reaction from his players and revealed that he left them alone for the first couple of minutes at half-time to discuss their lacklustre display between them. He added: "They were frustrated the first half. It's important they feel close enough that they can get on to each other. We have to make sure that doesn't boil over but it was quite calm by the time we got in there. "That's a good sign there's some leadership in the group. They recognise when they want to be better. Today they were harsh on themselves." England are 17/20 to win the Nations League A Group 4, while Spain are 29/10 after they sealed a second successive win with a 6-0 thumping of Croatia on Tuesday, while the Croats are priced at 10/3 to win the group.